In a time of titanic sandstorms, vile plagues, drought and pestilence - signs of God's fury and harbingers of the Apocalypse - the final conflict between good and evil is about to begin. 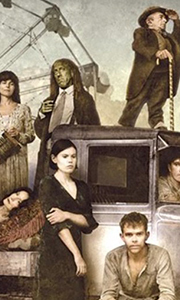 The battle will take place in the heartland of an empire called America as a travelling carnival, harbouring Ben Hawkins (Nick Stahl), a troubled healer, will clash with an Evangelical ministry lead by Brother Justin Crowe (Clancy Brown). And when it is..
Their journey. Their battle. Our future. As the final war between Good and Evil looms, two powerful avatars divided by fate share one mission. For Ben Hawkins and Brother Justin, the race is on to find the mysterious and elusive Henry Scudder - and the fate of the world depends on who finds him first. Special Features Audio Commentaries With Series Creator Daniel Knauf, Executive Producer Howard Klein, Cast And Crew, Museum Of Televisi..